The popular idea is to expand STEM to STEAM with the “A” standing for Arts. There is some pushback from both sides. There are science people who feel that the arts are just crashing the party and don’t belong there. There are artists who are uncomfortable with STEM, perhaps because of bad experiences with science and math classes when they were students. There is validity to these perspectives, but acronyms aside there is a healthy overlap between the arts, science, and math. For many artists, we are not crashing the party, we are already there. Those connections are being explored in a variety of exciting ways, and I would like to share some that I encountered at the conference. Aaron Fowler and Lisa Muci from Arts Partners Wichita presented Harnessing the Power of STEM and the Arts. Aaron is a musician and uses guitar and drums to teach about the science of sound. Instruments vibrate to create sound waves, and the pitch is related to the size of what is vibrating. Aaron does a good job of using STEM terminology in his presentation. It can be as simple as asking students which drum makes a lower sound. When they say, “The bigger one” he reinforces with “Yes, that means it has a larger diameter”. Science and the arts often explore the same areas with different vocabulary. Teaching artists can help bridge that gap. Lisa shared some good tools that Arts Partners Wichita has used to help artists explore the STEM concepts in their work. In particular, she showed a chart of scientific thought processes published by the Common Core Next Generation Science Standards. Armando Minjarez, the Wichita Teaching Artist who created the interactive art piece at the conference, had used the Next-Gen chart at a professional development workshop. “It was great,” he said, “I was able to tick down the list and say, ‘I do that. I do that.’ ” When the terminology is translated, artists and scientists can see the similarity of their thought processes. "Drawing robots used by Lee and Lajean Shiney of Wichita in upper elementary residencies. By constructing and using the robots, students learn about electricity and engineering as well as artistic principles." Student designed video games were presented by Marsha Dobryzynski from the Center for Arts-Inspired Learning in Cleveland and Andre Thomas from the Department of Visualization at Texas A & M University. Marsha showed clips of games designed by students at the newly launched High School of Digital Arts. The students gained coding skills while making aesthetic choices about the look and sound of the games. More elusive is the theatrical skill of making a game fun to play. Andre shared more advanced projects created by university students. One in particular has Renaissance Art History teachers drooling. The goal is to fill in a triptych of paintings. You advance to the next level by identifying different styles of perspective, shading, and color palette in a series of paintings. I have only a passing familiarity with this art, but I wanted to get my hands on the mouse and play this game! By the end of the game players can tell the difference between a painting from Florence in 1420 and one from 1460. Or they can tell you whether a painting from 1440 was from Florence or Flanders. The university students who worked on this and other games had to acquire an impressive depth of knowledge about the subject matter of their games as well as the computer skills to make the games a reality. Lee and Lajean Shiney from Wichita demonstrated The Three Legged Stool, a residency for upper elementary students that involves robotics in the creation of visual art pieces. After learning the engineering principle of the stability of a tripod (as compared to a four legged table that rocks back and forth if the legs are unequal), the students create a three legged robot where one leg is a motor that moves the robot and the other two legs are markers that draw. While building the robot students learn about electricity and closed circuits. 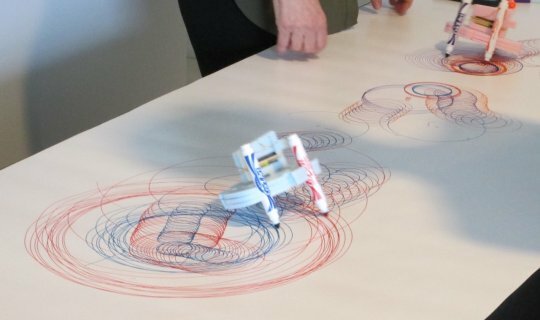 When completed, the robot draws circular or spiral designs kind of like a free-range Spirograph. The students can experiment with different orientation of the motor as well as different colors and positioning of the markers to create different effects. In the long form of the residency, the students then take a day to write an artist’s statement about their work and explorations. On the final day, they create their finished piece. They learn about the science and engineering of the robot as well as the aesthetics of using it as a tool to create art. "Juggling balls become atoms and molecules in an Earth Science assembly program by Jay Cady and Leslie Seifert-Cady of Kansas City." 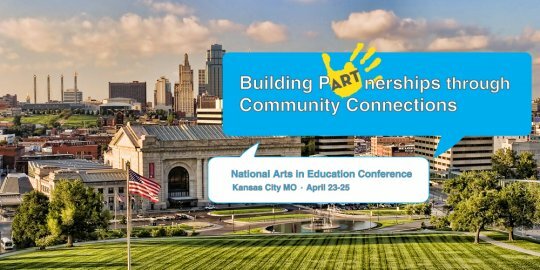 Kansas City teaching artists Jay Cady and Leslie Seifert-Cady of Laughing Matters (hey, that’s us!) presented STEAM-y excerpts from two STEM related elementary school assembly programs—Juggling The Earth’s Resources and Sum Of Our Favorite Numbers. Our approach is to teach more traditional curriculum concepts using our theatrical bag of tricks including juggling, mime, magic, improvisation, and humorous dialogue. We have programs that teach literacy, civics, math, and science. In the selection from Juggling The Earth’s Resources, we use juggling balls to represent atoms and molecules to show how oxygen (O2) and carbon dioxide (CO2) cycle between the animals and plants on Earth. We also demonstrate how burning fossil fuels adds extra carbon dioxide to the atmosphere and can lead to global warming. One administrator at the performance asked if we could do the program for Congress. Good idea! We were curious to see what a Teaching Artists Asset Map looks like, and found out from Jean Johnstone, the Executive Director of the Teaching Artists Guild. It is an interactive online map showing the location of teaching artists, organizations that use their services, and other assets. During her breakout session, many of us added our information to the map. The project grew out of a personal need she had to reconnect with the Bay area theater and teaching artist scene when she moved back after living elsewhere. The tool she developed was so useful that the project has scaled up to a national level with an eye to expanding globally. The Teaching Artist Guild program has a free informational level where teaching artists and administrators can connect with each other and other valuable assets they need for their work. It is also a powerful research tool to create a clearer picture of the careers, aspirations, and needs of teaching artists.  A paid level gives teaching artists access to benefits like financial advice and dental insurance. I hope you enjoyed looking at the many ways that teaching artists and administrators are exploring the rich interwoven connections of STEM and the Arts!